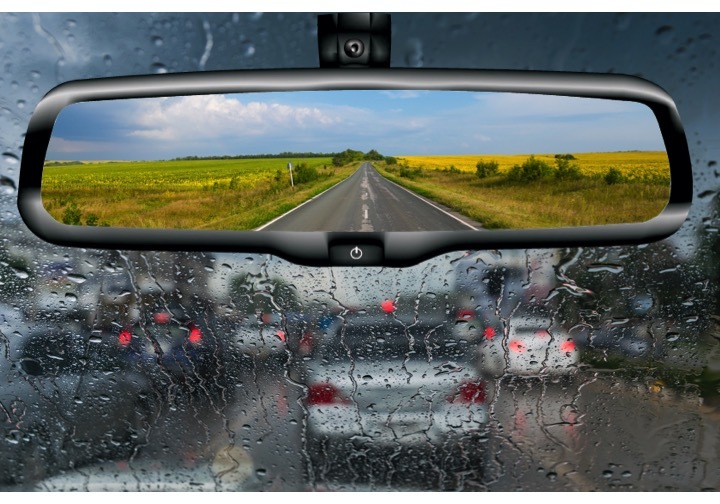 As an institutional asset manager, I often compared quantitative investment management to driving through the rear-view mirror. The view looking backward offers clear 20/20 vision that allows investors to update their inputs and dial settings while relying on objective analysis and eliminating emotion. The problems arise around corners or “inflection points” in the economy… where we tend to “oversteer”. The quantitative approach has both positive and negative aspects. On the other hand, fundamental management is akin to driving while looking through the front windshield during a rainstorm with broken wipers and bugs plastered to the glass. This provides a somewhat blurry vision of what is coming, but at least the view is forward, providing the ability to course correct – typically more subjectively. Once again, there are positive and negative characteristics associated with this style of investment management. The “Holy Grail” is to be able to merge these two completely different, time-tested approaches. Today, we will look backward with perfect hindsight and use what we learn to clean our screen for a clearer view of what lies ahead. Season’s Greetings – The US stock market has already put together 13 consecutive months of positive returns… an all-time record! In 2017, the markets enjoyed strong returns around the globe. The strongest returns were found in emerging markets equities (EEM), followed by the MSCI All Country World Index ex-US, and then a still strong US Large Cap stock market (S&P 500). This return pattern was very much a reflection of economic strength relative to expectations… the international economy showed a larger pick-up in growth rates relative to the US. The bond market earned its coupon as interest rates more or less “marked time”, with 10 year US Treasury bonds yielding 2.1-2.5% throughout the year. We did see the high yield (JNK) market do better than investment grade bonds (AGG) as credit spreads tightened. However, we are now very near record tight credit spreads, so the risk/return outlook is unfavorable for High Yield debt from these levels. Within the US, we saw a return to a strong ‘Growth’ market (Russell LC Growth) over the ‘Value’ sector (Russell LC Value). This was predominantly a reflection of a weaker US dollar and stronger growth overseas. The large multinational ‘Growth’ companies were best positioned to benefit from strength in overseas economies. We once again saw Small Cap stocks lag Large Cap stocks. Looking forward, Value and Small Cap (RUY) stocks appear inexpensive relative to Large Cap Growth and could benefit most from potential changes to the tax policy. An old adage says “The stock market climbs a wall of worry”. This simply means that as the stock market rises as a whole there are more and more investors that believe the existing rally will come to an end. But, the higher it goes, the more greed takes over and more and more investors jump on board and continue to invest. The more this behavior continues, the more prices continue to rise, thus fueling the rally and creating a self-fulfilling prophecy. At some point, the rally becomes based more on price movement than fundamental value of the underlying stock. And as the other saying goes, “the bigger they are, the harder they fall.” The higher up the worry wall the market climbs, the more precipitous the drop when the market loses its footing. Right now, there are three primary “worries” that comprise the current wall. We are paying particularly close attention to Geopolitics, Rising Interest Rates, and Valuation. Global Thermonuclear War starts on the Korean Peninsula, ISIS/terrorist strikes damage infrastructure in the Middle East and beyond, cyber-warfare, bio-hazardous germ warfare, drought, pestilence, locusts, frogs, and alien invasions are the usual suspects that are often included in this category. These outcomes are impossible to score. However, it appears clear that our allies are increasingly disillusioned with our role and our enemies are more emboldened and on alert. The ‘end of the world clock’ has never been closer to midnight (other than 1953, when the US and the Soviet Union were both testing their first Thermonuclear devices…aka H-Bomb). Optimists will say the US has done quite well since the time that Elvis first hit the stage, thank you. The pessimist will say that we are on borrowed time. The realist will say that the risks are real and we never know when the market will decide to price those risks. All that said, the risks do seem to be rising. However, somewhat inexplicably, the market continues its climb over each headline risk, as we have enjoyed the longest period of prolonged lack of volatility in the history of the stock market. Eventually, volatility will return to the market as the mean reverts, and we believe that could translate into substantial downside risk. However, in the meantime, the market continues to climb ever higher. Now that the Fed has begun to raise interest rates and allow the reserves accumulated through their Quantitative Easing program (last month’s blog) to unwind, investors are concerned that rates will normalize back toward 4-5%. As 10 year US Treasury rates hold steady in the 2.1-2.5% range, investors are living with the risk and climbing over this worry, for now. Notice the chart above from the National Bureau of Economic Research that shows the overall risk for a potential Global Economic Policy misstep. The policy uncertainty index charts uncertainty through news articles, changes in political control, changes in tax policy, monetary policy, and dispersion in economic estimates. The chart graphically depicts what is meant by “climbing a wall of worry”. The actual policy uncertainty is now even higher than that realized during the GFC (Great Financial Crisis). Indeed, the market has risen in near lock-step fashion with the uncertainty index, which is counterintuitive to what investors would normally expect. No matter how we analyze market valuations, the market is at or near record high values, which has been the case for the past year. That said, valuations alone aren’t a catalyst for a market decline. However, valuations will determine future rates of returns which makes when you invest almost as important as in what you invest. From current price levels, history suggests that investors can expect approximately 2-4% annual real (after inflation) returns over the next 10 years. Also, the scale of the ultimate market correction (although there is nothing that states market prices MUST correct) will be impacted by the severity of the over-valuation. So far, the market is happily rationalizing the record price levels and continues to grind higher. Waiting for tax reforms reminds me of the iconic Heinz Ketchup commercial in the 1970’s that shows the young boy patiently waiting for his prized ketchup bottle to delicately and deliciously drip mouthwatering, flavor-filled, tomato sauce all over his burger, as Carly Simon melodiously sings “Anticipation” (Ann-ti-ci-Pay-Aay-Shun) in the background…mmmmm? Well, this is the same scene as investors await their precious, promised tax cuts. We will dig further into the specifics of tax policy in a future blog since the final bill has passed and we know what we’re dealing with. For now, suffice it to say… it will be a net positive for the corporate world (more so than for individuals), but likely much less so than conventional wisdom suggests. Inventories are a typical swing component in growth that act like an accordion. Sometimes inventories stretch and get ahead of an economy and sometimes they lag and compress the GDP growth rate. The US Real (inflation-adjusted) GDP growth rate looks likely to rebound to 2.5+% in 2017 after falling below 2% in 2016. In fact, after growing at an average 2.3% rate from 2013-2015, the US economy actually slowed to 1.8% in 2016. The deceleration in 2016 was largely due to a stronger US dollar and lower government spending. The stronger currency in 2016 hurt competitiveness and compressed revenues and earnings when translated back into US dollars. The government spending cutbacks in 2016 came from a Republican Congress that was intent on maintaining a deficit hawk image. That image has since been tossed aside, now that we have a Republican administration. The third temporary cause for a 2017 bounce in GDP growth is an accumulation of business inventories, which basically borrows from future growth. Inventories are a typical swing component in growth that act like an accordion. Sometimes inventories stretch and get ahead of an economy and sometimes they lag and compress the GDP growth rate. Lastly, a more positive and sustainable component of GDP growth was the pick-up in global economies and markets. This was a far larger contributor of higher US GDP growth than anything the new administration created domestically. The global economy showed signs of life in 2017, growing at a 3.5%+ rate after habitually slogging along below 3% since the Great Recession. The stronger global economic growth, coupled with a weaker US dollar, finally helped US trade, on the margin. Overall, business and personal GDP growth have been steady at about 2.25% over the past 5-7 years, with government spending, net trade deficit, and inventory accumulation providing volatility around that number. The true test will be if the rate of GDP growth continues up over 3%, or levels-out in the 2-2.5% range that has become the norm since the Great Recession. This “easy comparable” syndrome, which occurred due to a decent bounce in 2017 GDP growth coming off a subdued 2016, reminds me of what happens during college football bowl games each year. During college bowl season, we find out which conferences benefitted from easy competition during the regular season. Those conferences eventually get exposed. As an alum of the University of Illinois, I was particularly scarred by the 1984 Rose Bowl game. I witnessed my beloved Illini (then favored by 18 points) get trounced 46-9 by UCLA after leaving the “easy comps or competition” of the Big 10 conference. This year’s economy not only feasted on easy 2016 comps, but with the global economy kicking in more aggressively combined with a weak currency and inventory builds, it is as though we got an extra scholarship for a top recruit to aid in our battle this year. The “comps” are about to get more challenging. Is it obvious that the snow has not been spectacular here in Tahoe and I have spent too much time watching college football? 2018 Through The Windscreen – Where Are We Going? Productivity (particularly as it relates to wages). Let’s examine each in turn with an eye towards how they might influence global economies and markets. All other things being equal, the time for cutting taxes or expanding deficit spending would have been following the Great Recession, not following the 9th year of an economic expansion. The role of government within the economic realm in a capitalist society is to 1) Create and maintain a legal framework for fairness, confidence, and incentives to prosper, 2) Provide infrastructure to help facilitate trade, improvements to health, safety, training, and education, and 3) Enforce regulations to deter abuses. After that, get out of the way. Keynsian economists actually argue that the government should also strive to stimulate the economy through deficit spending/tax cuts during times of economic weakness, while similarly harnessing growth during times of economic overheating. This toggling of stimulative and restrictive fiscal policies act as a governor to prevent the economy from careening too far in any one direction. The raising and lowering of taxes is one such toggle. Ideally, taxes are to be raised in times of prosperity to save for a rainy day. All other things being equal, the time for cutting taxes or expanding deficit spending would have been following the Great Recession, not following the 9th year of an economic expansion. Let’s not sugarcoat this. That tax reform process was sub-optimal and seemed rushed. Most Senators, including Republicans, weren’t even given enough time to review the new tax law prior to voting on the initial bill. Senator John McCain made it clear that he did not think it went well. When President Ronald Reagan’s Republican party reformed tax policy in 1986 there were 33 public hearings with dozens of scorings by the Congressional Budget Office (CBO). The bill passed 90-10 in the Senate. Even still, that program led to an explosion in public debt following a massive shot in the arm to the markets. Yet the broader economy never benefited in terms of “above trend” economic growth throughout the Reagan/H.W. Bush years. Throughout this year’s tax reform process, there were no public hearings and the Senate used “reconciliation” to avoid needing 60 votes. As such, the bill passed with a straight-up partisan 51-48 vote. This tax reform bill received scary scorings from the (CBO) for its impact on the deficit. The CBO claims the recently approved tax bill will lead to increasing the Federal debt by $1.5T over the next 10 years. This is the case even under rosy, non-recessionary economic growth assumptions. Think about that. Even after 9 years of non-recessionary growth (second longest in history), the CBO scored this bill assuming no recession for the next 10 years and it is STILL expected to add to the deficit. That means that the deficit will surely soar in the likely event that we do have a recession within the next 10 years. The fiscally conservative Republican Party that once protected against swelling deficits appears to be conspicuously absent from the Congressional floor. The reality is that the effective US corporate tax rate is already 24% (not the 35% quoted by the administration). This means there will be winners and losers among sectors, as we move to a flat 21% for corporations. For example, Amazon’s effective rate is currently 38% (winner), while Nvidia only pays an effective 13% rate (loser). The biggest benefit realized from the proposed tax policy will be the eventual repatriation of US earnings/cash by US-based corporations from overseas accounts. This should help spur mergers/acquisitions, stock buybacks and increase dividends. The jury is still out on whether we will see higher wages and increased capital expenditures. Our view is that any benefit of lowering the corporate tax rates will be offset by higher debt levels down the road. The new tax bill should provide short-term gains for the stock market at the expense of long-term challenges to our deficit. Sadly, this appears to be the modus operandi for both sides of the aisle in our modern day Congress. Deregulation will help certain industries (domestically oriented financials, retail, energy, and segments of healthcare), while likely hurting others (multi-nationals). Unfortunately, the short-term gains will not come without potential long-term pain down the road. Take for example the subprime credit crisis of 2008-2009. The subprime crisis was largely a byproduct of deregulation by both political parties that created a system that encouraged moral hazard. Moral hazard exists when a person or entity engages in risk-taking behavior based on a set of expected outcomes where another person or entity bears the costs in the event of an unfavorable outcome. Think Bank Bailouts! All of this was allowed so politicians could curry political favors from industry lobbyists and industry titans. It certainly feels as though some of the deregulation programs currently getting passed increase the risk of re-visiting some of those horrendous ethical dilemmas that almost took down our capital markets. Ethics aside, deregulation in the energy sector will help our trade deficit as we move from a net importer to a net exporter of oil. This large swing in global energy markets will correspondingly put upward pressure on the USD, thus ultimately pressuring earnings of large multinational U.S. domiciled corporations. This policy entanglement exemplifies the potential unexpected impact and unintended consequences in unrelated portions of the economy. Another example will be the rollback of Dodd-Frank and the Volker Rule in the Financial industry. Deregulation in financials will likely ease lending restrictions, which should lead to higher industry profits and potentially place upward pressure on inflation. An uptick in structural inflation would not be ideal this late in the economic cycle. Not only that, but deregulation will likely lead to more instability in our nation’s banks. Our view is that Deregulation may ultimately end up having a larger initial upward impact on future economic growth than the total net impact of tax reform. We also expect that there will be long-term consequences associated with these short-term gains. The larger factor for the markets to digest is the unwinding of the Fed’s QE (Quantitative Easing) program. The Federal Reserve Bank (the “Fed”) is the banker’s bank. It is charged with oversight of the banking industry and maintaining solvency while managing interest rate and liquidity conditions for our economy. Similar to fiscal policy, the Fed operates counter-cyclically to economic activity. Since the Great Recession began in 2008, the Fed has done most of the heavy lifting to keep the economy moving. It will now be charged with offsetting the net effects of the new tax policy, while also attempting to maximize full employment, stabilizing financial conditions, and maintaining price stability. The Fed raised interest rates three times in 2017 from 0.75% to 1.5%. Looking forward, the market is pricing-in ONE .25% interest rate increase in 2018, while the Fed is expecting THREE more .25% hikes (based on their published “dot plot”). The larger factor for the markets to digest is the unwinding of the Fed’s QE (Quantitative Easing) program. The Fed has a number of balls in the air as it tries to stay ahead of potential inflation created by the tax policy from this low level of unemployment, while also making sure the markets don’t get spooked as they begin to wean themselves off their “drug of choice” (cheap money). Complicating the Fed’s job will be the swearing in of a new Fed Chairman to replace Janet Yellen in February 2018. My mind races back to 1987 when the markets tested the then-new Fed Chairman, Alan Greenspan, after he replaced Paul Volker. The markets collapsed in October of that year, eventually leading Greenspan to turn on the monetary hoses, reflating the stock market. It will be no surprise if the markets test the new Fed Chairman relatively early in their term. The surprisingly disappointing evidence over the past 10 years (since the Great Recession) is that despite huge technological advancement, we are not capturing the gains in the form of higher productivity as measured through GDP accounting…. that means non-inflationary productivity enhancements are NOT helping us grow out of our increasing debt loads. Be careful for what you wish. More advantageous trade terms aggressively negotiated through a more transactional and less strategic approach will likely lead to less trade and higher prices, despite a stronger USD. As Charles Plosser, former Philly Fed President and CEO, stated at an event that I attended earlier this year… “higher prices and weaker economic growth are a Central Banker’s nightmare”. A stronger dollar further complicates the Fed’s ability to fight potential inflation through higher interest rates. Artificial Intelligence (AI), Machine Learning (ML), Blockchain, Robotics, and Innovation – those are the buzz-words and themes that will continue to grow in 2018 and beyond. Interestingly while all of these concepts are almost universally viewed as positive, ultimately these trends will put downward pressure on wages. The surprisingly disappointing evidence over the past 10 years (since the Great Recession) is that despite huge technological advancement, we are not capturing the gains in the form of higher productivity as measured through GDP accounting. That means non-inflationary productivity enhancements are NOT helping us grow out of our increasing debt loads. I realize that many readers live in the Silicon Valley and will want to argue with this statement. So, I promise to dedicate a future article on this topic to flesh out the evidence from an economic perspective. The consensus opinion is that populism will not fix stagnant wages. The simple fact is that innovation will continue to put downward pressure on wages for most of the population. The shareholder class (equity owner) is much more inclined to benefit from today’s trends than the stakeholder class (employee)…regardless of which political party is in power. WILD CARD ALERT: There is little debate that the economy, and the stock and bond markets have greatly benefited from low inflation and low volatility. In fact, in addition to the S&P 500 setting records for consecutive monthly gains, the stock market is similarly setting records for low volatility almost daily. Most market commentators agree that the record low volatility and record high market prices are inexorably intertwined as one grinds lower and the other grinds higher. There are many factors that contribute to these idyllic economic underpinnings, which have correspondingly helped create an environment of low-interest rates and high earnings multiples. Due to overcapacity in the global production markets, it is unlikely we will see a significant unexpected rise in inflation that negatively impacts interest rates, volatility, and stocks prices. In fact, the consensus view is for inflation and volatility to drift just a bit higher than current, but still at comfortably low levels. As Bank of America Merrill Lynch’s strategist, Michael Hartnett, recently put it, the “best reason to be bearish is there is no reason to be bearish.” Contrarian much? That said, consensus is so strong against a surprise increase in inflation that it could be quite detrimental to all financial assets… if we were to see the “whites of its eyes”. This is important because passing tax policy this late in the economic cycle coupled with individually negotiated trade “deals,” increases the odds of higher than expected inflation. As such, we feel it is prudent to consider some form of inflation protection (which is cheap) in addition to allocating to truly diversified alternative asset classes. The economy and markets have been on cruise control due to artificially suppressed interest rates through Quantitative Easing (QE) policies by the world’s Central Bankers. The US economy also benefited from easy comparisons coming off a weak 2016 and a bounce back in the global economy. Looking ahead, we have fiscal policy being applied at a strange time, given the maturity of this economic recovery. Normally, we would expect a pro-growth tax policy coming out of a recession, not 9 years into a recovery. This will likely accelerate the world’s Central Banks to move to a more restrictive stance. All of this will finally introduce a bit more uncertainty into the markets. In fact, it is time to let the markets determine winners and losers, rather than use artificially suppressed interest rates to prevent business failures. Not everyone gets a ribbon anymore. The bottom line suggests that given all of the uncertainties and moving pieces in the global economy, stocks look better positioned than bonds at this juncture, but many alternative investments offer the most favorable risk-return payoff. My forecasting goggles indicate that an increase in uncertainty in Monetary Policy coupled with growing tensions in the geopolitical landscape will create a negative market-month at some point in 2018; i.e. the record consecutive winning streak for the market will come to an end in 2018. How’s that for a prediction…too bold?